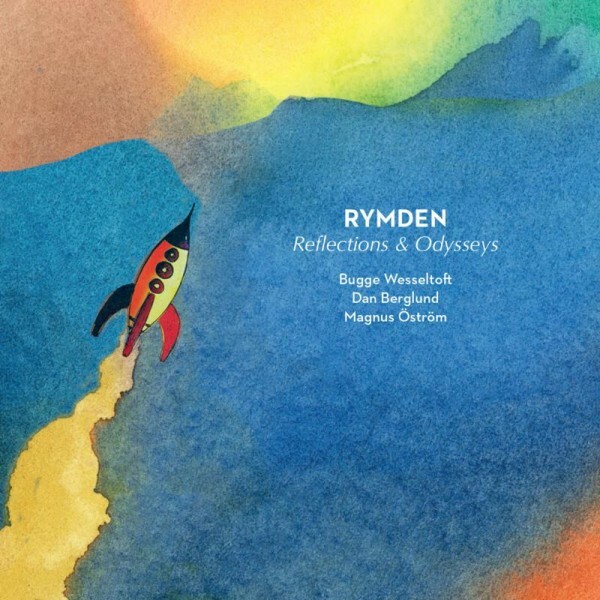 ‘Reflections & Odysseys’ is the debut album by a veritable European jazz supergroup that sees pianist Bugge Wesseltoft return to the piano trio format with the Swedish rhythm section of Magnus Ostrom and Dan Berglund, who shot to fame as two-thirds of the Esbjorn Svensson Trio (e.s.t.). found encouragement and a home on Wesseltoft’s Jazzland Recordings label. e.s.t. remain regarded as one of the best live acts of the era, and they hold their position as the most successful artist on the Munich-based ACT record label. That a crossover between these two powerhouses of 21st century of European jazz should occur is not surprising, although perhaps long overdue. With the formation of Rymden (meaning “space” – as in “outer space” or “universe”), we are presented with a music that is innately Scandinavian in mood and attitude. This is music that reflects all aspects of the Scandinavian milieu of the 21st century, filled with rugged dynamism, extended playing techniques, brooding or melancholic atmospheres. It offers cinematic and epic sounds, cascading drama, crashing and splashing, tension and release. It delivers melodic, highoctane unison riffs, Minimalism immersed in rich improvised tapestries, vocal doubling of melodies, and moments of growling menace. Rymden does this with minimal electronic trickery, with Wesseltoft moving between piano and Rhodes, and Berglund and Ostrom coaxing just about every possible sound from their instruments.